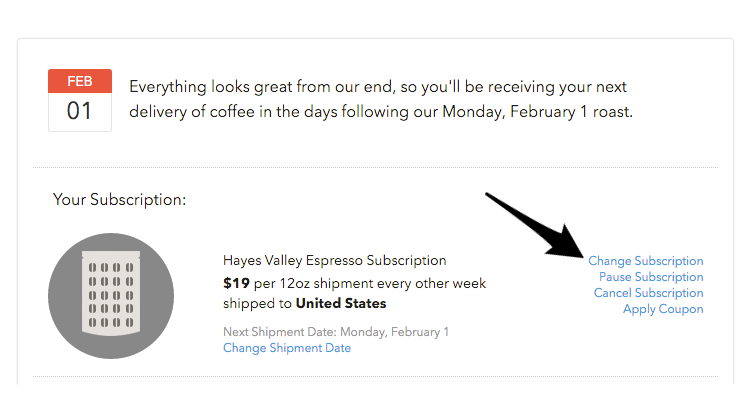 Can I change the amount of coffee I receive with every shipment? 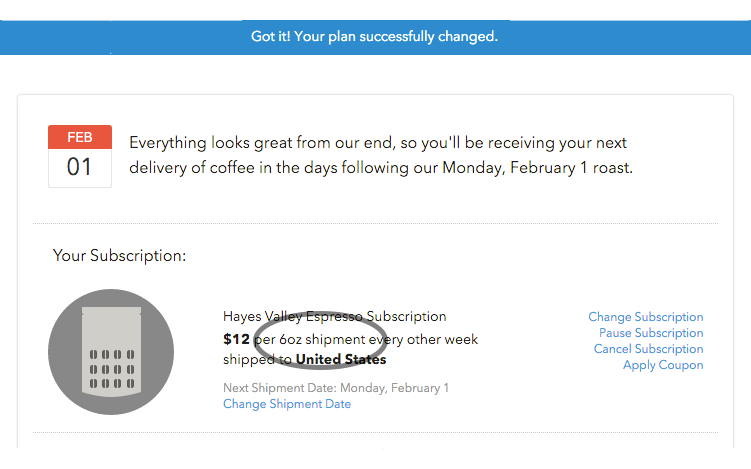 It’s simple to change the amount of coffee you receive with every shipment by simply heading over to the Subscriptions section of your account dashboard and using the “Change Subscription” feature. Head over to the Subscriptions section of your account dashboard (if you’re not logged in, you’ll be prompted to do so) and click the Change Subscription link. Decision time! How much coffee would you like? For this example we’re changing from a 12oz “Standard Bag" to a 6oz “Half Bag”. 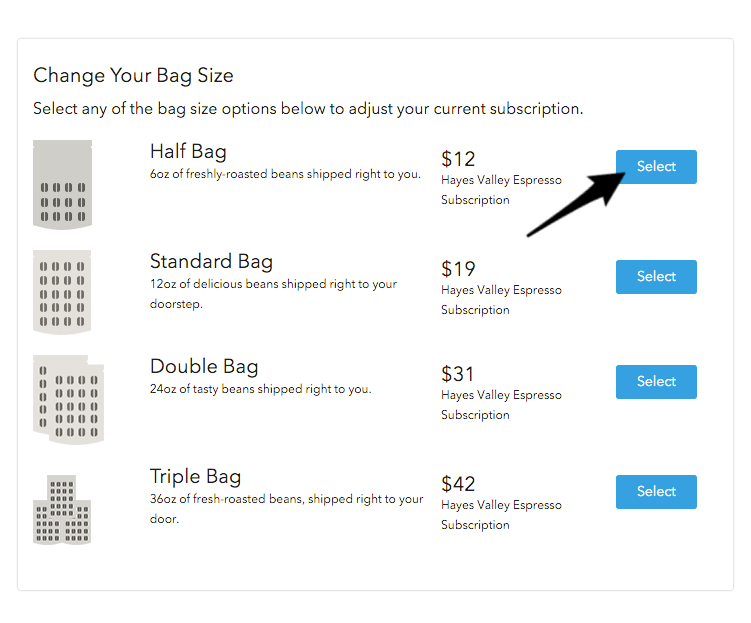 Click the “Change” button to the right of the current bag size. You’ll be presented with a range of bag sizes from which to choose, from the smallest 6oz “Half Bag”, all the way up to the 36oz “Triple Bag” option. 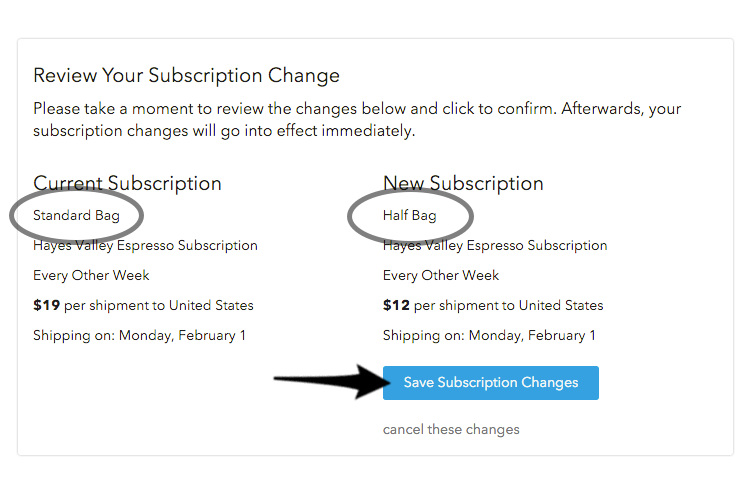 Since we’re switching to a 6oz “Half Bag” in this example, we’re clicking on the “Select” button to the right of the 6oz “Half Bag” option. Voila! We’re back at the screen from step 2 but now it reflects our change to the 6oz “Half Bag” and even indicates what we’ve changed from — the 12oz “Standard Bag”. Looking good! From here you can continue to make other changes — like the type of coffee or frequency — or continue on if you’ve made all the changes you’d like. Since we’re only here to change the size of the bag, we click the “Continue to Review” button. Almost done! 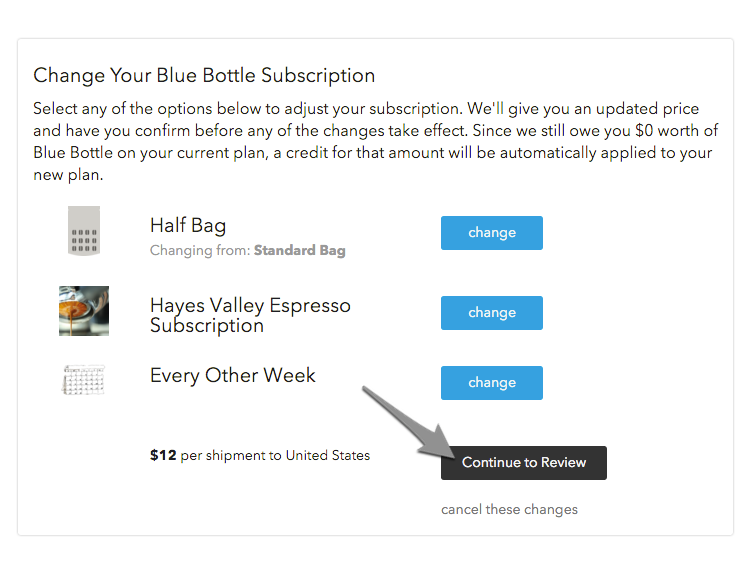 Just for thoroughness’ sake, we’re brought to a review section that lists both the various details of the current subscription and the details of the new one. Still looking good. 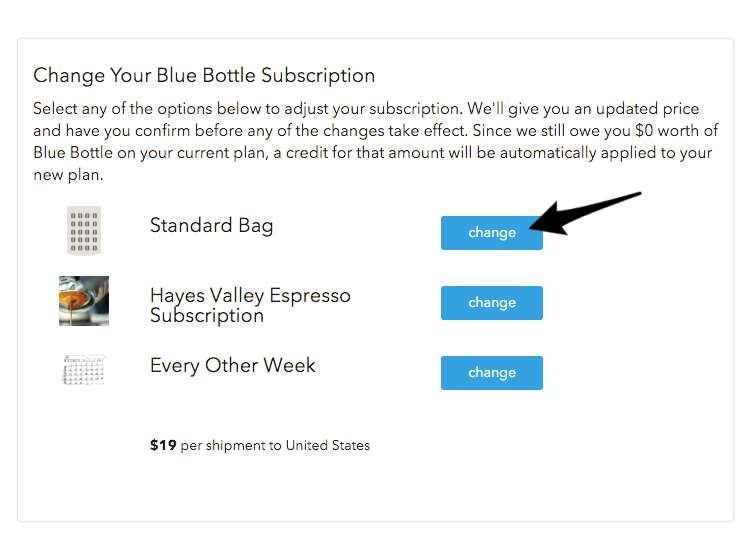 Let’s click the “Save Subscription Changes” button and finish this up. That’s it! Bask in the glory of your accomplishment and gaze proudly at your newly modified subscription.